The reply 2 weeks ago was “Ida Know”. The reply 1 week ago was “Ida Know”. The reply 3 days ago was “Ida Know”. The reply at 4:00 PM yesterday was “Ida Know”. I asked, “How about a personalized name plate for her desk? I love my brand new teenager with all of my heart but sometimes her exuberance is a little underwhelming. 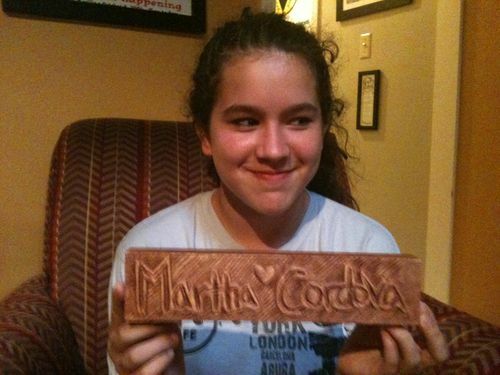 I found a hunk of Bass Wood and asked her to write down Martha’s name. I got out the carving tools and with my very beginner-ish efforts I carved out the name plate in a few hours. I gave her sand paper, Warm Cherry Stain and wipe on poly and said go for it. Looks good. I’ll bet Mom loved it. And was Mom proud when Victoria said ”I did it myself! Well, Dad helped” ? Great gift for mom. Be thankful that she will work with you, you must be doing something right. Nothing like getting in under the wire! Nice rescue, Mark!! and nice desk sign!! Nice job on the carving Mark. It does get easier. You are definitely on your way. The part that really gets me is your girl knew how to finish it. I’d say she is a bit past the knowledge curve for a 13 year old. Good job on the carving. Good luck with the teenager. Monte, you brought up the question of a lifetime. Am I doing the right thing by my daughter? I can say for certain that my Wife is definitely doing the right thing. ;) I’m just lucky to be around. Jim, thank you sir! I look at it as an acceptable carving. I’ve seen worse, meaning my other carvings. Still – if my daughter were to give me one – I would cherish it. I think that’s what counts. Thanks for the compliment Carver. I remembered that Victoria helped me stain some shelves and brush on three coats of poly with sanding in between. Freddy – thank you sir! I’ll take all the luck I can get. Great job, and beautiful daughter. Thanks John! I’d tell her she is beautiful but.. No buts. I’ll pass it in. Howdy Joe! Thanks for the reminder. Victoria is far more precious than anything I can fashion out of wood or any bit of music I can write. Wow, so you’ve got your daughter sanding and finishing projects for you? That sounds like a sweet deal. Do you think she might be interested in sanding and finishing a dining room table? Because I know a way she could get her hands on something like that. I’d be setting her to work in a similar manner on all your future projects! Joking aside, this is a lovely family gift, and you should be proud to have raised someone who as a teenager likes you enough to do that with you (I work with teenagers… they would not all be as on board as she was). Bravo! Ivan – thank you very much sir. Bailey, it sometimes takes a little bit to get her moving on the small projects. I wonder how much it will take for an entire dining room table? How many chairs? 12? We better get started now. With her new attitude toward work, she’ll be done by the time she graduates from College. I say that in jest. But I do have a major project for her to help on. We still haven’t built her bedroom furniture. What I hope to do is show her that she can work a project from start to finish. That would be the best gift I could ever give her.